Tucked inside the Communications Decency Act (CDA) of 1996 is one of the most valuable tools for protecting freedom of expression and innovation on the Internet: Section 230. This comes somewhat as a surprise, since the original purpose of the legislation was to restrict free speech on the Internet. The Internet community as a whole objected strongly to the Communications Decency Act, and with EFF's help, the anti-free speech provisions were struck down by the Supreme Court. But thankfully, CDA 230 remains and in the years since has far outshone the rest of the law. Section 230 says that "No provider or user of an interactive computer service shall be treated as the publisher or speaker of any information provided by another information content provider" (47 U.S.C. § 230). In other words, online intermediaries that host or republish speech are protected against a range of laws that might otherwise be used to hold them legally responsible for what others say and do. The protected intermediaries include not only regular Internet Service Providers (ISPs), but also a range of "interactive computer service providers," including basically any online service that publishes third-party content. Though there are important exceptions for certain criminal and intellectual property-based claims, CDA 230 creates a broad protection that has allowed innovation and free speech online to flourish. This legal and policy framework has allowed for YouTube and Vimeo users to upload their own videos, Amazon and Yelp to offer countless user reviews, craigslist to host classified ads, and Facebook and Twitter to offer social networking to hundreds of millions of Internet users. Given the sheer size of user-generated websites (for example, Facebook alone has more than 1 billion users, and YouTube users upload 100 hours of video every minute), it would be infeasible for online intermediaries to prevent objectionable content from cropping up on their site. Rather than face potential liability for their users' actions, most would likely not host any user content at all or would need to protect themselves by being actively engaged in censoring what we say, what we see, and what we do online. In short, CDA 230 is perhaps the most influential law to protect the kind of innovation that has allowed the Internet to thrive since 1996. Click here for our infographic about the importance of CDA 230. 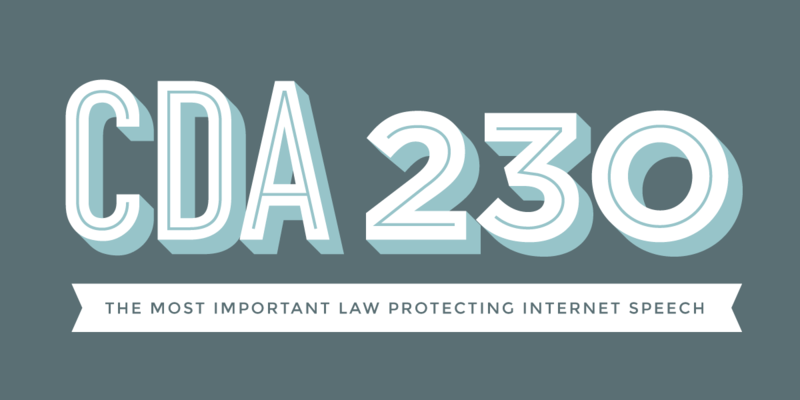 CDA 230 also offers its legal shield to bloggers who act as intermediaries by hosting comments on their blogs. Under the law, bloggers are not liable for comments left by readers, the work of guest bloggers, tips sent via email, or information received through RSS feeds. This legal protection can still hold even if a blogger is aware of the objectionable content or makes editorial judgments. The legal protections provided by CDA 230 are unique to U.S. law; European nations, Canada, Japan, and the vast majority of other countries do not have similar statutes on the books. While these countries have high levels of Internet access, most prominent online services are based in the United States. This is in part because CDA 230 makes the U.S. a safe haven for websites that want to provide a platform for controversial or political speech and a legal environment favorable to free expression. EFF works to ensure strong legal protections for Internet intermediaries and endeavors to fight threats that would weaken such protections for intermediaries and users. We realize that a combination of technology policy and law protecting intermediaries ultimately helps uphold freedom of speech online. NOTE: This summary of CDA 230 isn't a substitute for, nor does it constitute, legal advice. Only an attorney who knows the details of your particular situation can provide the kind of advice you need if you're being threatened with a lawsuit. The goal of these pages is to give you a basic roadmap to the legal issues surrounding the interactive computer services covered by CDA 230.